San Diego Network Cabling & Wiring technicians are available to conduct comprehensive site surveys/walk-thrus, develop detailed infrastructure designs, install a wide variety of data cabling and other transmission media, and provide ongoing support and maintenance. Let our expert San Diego network wiring and network cabling installers bring the benefits of an advanced communications network into your office with a convenient, on-site, professional installation. San Diego Network Cabling & Wiring is your trusted source for business communication solutions. Whether your business phone system requirements are for a digital phone system, VoIP phone system, or a combination of the two, our friendly staff has the expertise to design, install, and maintain the solution that is right for your company. 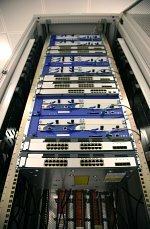 San Diego Network Cabling & Wiring is a single source telecommunications provider. In addition to providing the best in equipment, cabling and infrastructure, we also assist our customers in the selection and implementation of telecom network and services. From analog lines to PRI’s,VoIP, MPLS, and point to point circuits, we will help you navigate the ever changing world of voice and data carriers and solutions. Our experienced staff has the ability and expertise to assist you with the design and installation of your data cabling, voice and audio/video cabling & network wiring. We offer San Diego & Southern California a one source solution for all your networking & business phone system needs. Our approach is to look not only at your immediate goals but to take into account future applications, growth of your organization and technological advancements which may impact your communications requirements. We are a San Diego network cabling / wiring company that provides voice & data cabling, San Diego fiber optics installation, business phone system sales & installation, VoIP phone systems and other services in Alpine, Bonita, Bonsall, Camp Pendleton, Cardiff by the Sea, Carlsbad, Chula Vista, Coronado, Del Mar, Descanso, El Cajon, Encinitas, Escondido, Fallbrook, Imperial Beach, Jamul, La Jolla, La Mesa, Lakeside, Lemon Grove, Lincoln Acres, National City, Oceanside, Pala, Palomar Mountain, Pauma Valley, Poway, Ramona, Rancho Santa Fe, San Diego, San Luis Rey, San Marcos, Santa Ysabel, Santee, Solana Beach, Spring Valley, Valley Center, Vista and surrounding areas. Please contact us for a free site survey and written estimate.